Brew Facts: This is a spontaneously fermented beer, a technique that dates back to ancient times. This occurs when the wort, the already boiled grain mash, is left open to the world, allowing Mother Nature to deposit her bounty of wild yeast into the beer to ferment it. Modern techniques are a little more controlled than that, but other things can find their way into the beer (bacteria, microorganisms, raccoon) with interesting results. Appearance: Pours a headless, cloudy amber with enough haze and fast moving bubbles trails to be mistaken for a lite cider. Not remarkable or particularly interesting to look at, but not every beer needs to surprise in the looks department. If anything, it’s a little lighter than most Gueuze’s I’ve had. Aroma: A sniff finds surprising restraint on the acidic and mineral/iron aromas. 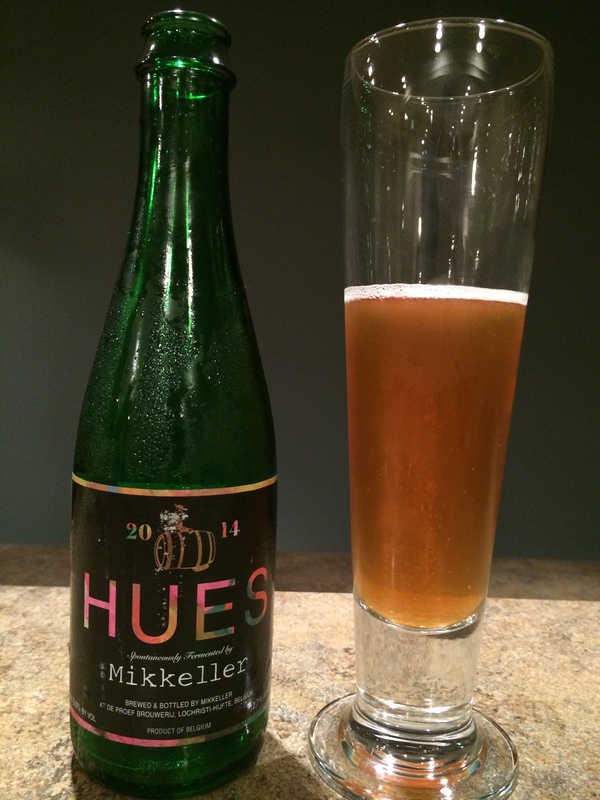 There is an astringent/vinous quality as there is with most Gueuze, but Hues is mild for the style. Still, this beer doesn’t shy away from the classic Gueuze aromas: metallic, sour apple, with a musty goat undercurrent. I say undercurrent because it isn’t prevalent enough to be off putting or carry sulfurous qualities, but has the right amount of funk. Just a touch of sweet grape as well. Taste/Mouth Feel: A drink confirms that this has the mouth fell and active carbonation of bubbly, it is called Brussels Champagne after all, but not quite as aggressive as its French counterpart. Really, that can be said about this beer in general. It’s assertive, but lacks aggression and bite. I drink again and it’s clear that the metallic/mineral and acidic qualities are the show here, but even these featured players don’t hit anywhere near as hard as other Gueuzes. Pretty damn balanced and mellow for the style, possible due to the oak barrel aging. There is a bready quality that tames a creeping sour funk, but the sour is still strong enough to tingle the back of the tongue. Not a sour bomb, but it surprises as a pleasing, easy drinker. Be sure to roll the beer around the mouth to hit different flavor receptors and keep this beer delectable throughout. Final Thoughts: I know I harp on drinkability, but this is a sour beer that keeps the alcohol under control, features the classic elements of the style, and doesn’t overindulge. This also means that the flavors aren’t particularly deep or complex, but it makes for a good drinkin’ not thinkin’ beer. It’s ideal as a starter Gueuze for the craft beer-ers that are just dipping their toes into the sour waters. If it were a bit cheaper, I could see having a few around for a chill evening party with a few guests. You’ll keep your wits about you and stay your charming self, but still have a beer that won’t put your palate to sleep.